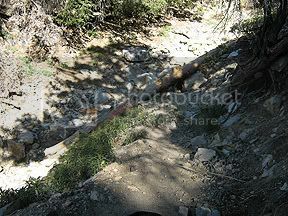 The trip to the north side of Mt San Jacinto took a couple of hours. 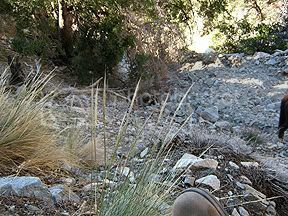 We wound up in the San Gorgonio River basin at Stubble Canyon Creek. We had planned to camp there just off Snow Creek Road. Our backdrop was the beautiful Fuller Ridge covered with snow at the edge of the 10,804 foot San Jacinto Peak. It was only1 PM so I decided to ride north to the Cottonwood Trail Head. Since it was only 6 miles to the trail head, I expected to be finished well before dark. Riding through the river basin in deep sand I failed to notice that Port lost a hind boot. He never took a misstep except when we got close to I10 and he had to negotiate a railroad tunnel, 18 wheelers passing over head and wind turbines rotating and humming. I noticed then that the boot was gone, and I wasn’t going back to look for it. Port and I pulled away from the obstacle course and moved on toward a defunct subdivision. Burton was there, close, but separated by a barbed wire fence. 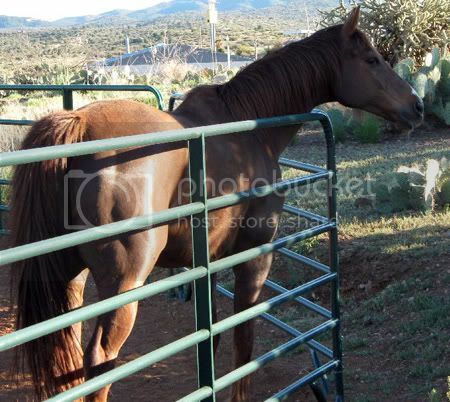 To get around the fence I rode due west going through a junk yard. As we made a slight climb out of the wrecked cars, gaping buses, overturned trucks and blue tarped mobile homes, I came upon a sign in log for hikers. I signed Grayhair and Port (heading north) and left my pen for the next passerby. Shortly, we loaded up and drove back to Snow Creek Road to camp. Port spent the night in the trailer (I have it set up like a box stall with small fans and bedded deep) eating and drinking the night away. We arrived at Cottonwood Trailhead at 7 AM. I looked out at some distant wind turbines and wondered how close we would get to them. Mesa Wind Farm is PCT friendly with water and a place to rest, but resting with Port close to those turbines just didn’t seem plausible. As we passed the wind farm, Port only glanced at the big rotating giants that hummed like a million bees. What a great horse! 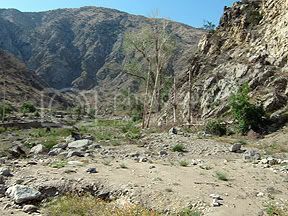 We traveled along the edge of the Teutang Canyon toward Red Dome and Whitewater Canyon where Whitewater River was our companion for a few miles. The rocky riverbed made it hard to follow the trail, and we both watched for it to cross the river so Port could get some water. We got a drink, and promptly pulled up hill from the original 1195’ where we camped, to over 3,000’. We crossed Mission Creek several times in a wonderland of trees with a trailside creek for all the drinking we needed. Noon brought us to the East Fork of Mission Creek so we stopped for lunch. I gave Port a bath while some hikers slept under some grand old trees shading the creek. I happened to look down stream and saw what looked like a naked fanny! Yep! That’s what it was. A gal with her friend from Italy were enjoying the creek like no one else was around. Guess what? The friend, Alfredo walked right over to talk with me about Port. Seems he is an ex Italian Jumper rider (of some renown) and he just couldn’t resist touching Port and discussing his history. Yes, Alfredo had on his clothes for the encounter, He may not have been skinny dipping as was his friend, Alicia. Alfredo and Alicia turned out to be an interesting couple that are sailing the world and adventure seeking. They somehow decided to walk the PCT to Canada as one of their adventures. Knowing that I had a long ride yet ahead I tacked up and headed out. Today’s mileage to travel was 27+ miles and we were only part way there. My plan was to camp tonight then get to Heart Bar & Burton tomorrow morning. We continued climbing with the trail passing several great camping sites, but I wanted to get to a known creekside camp with water for Port. The trail disappeared in an old road which, if it was dark, we would never have been able to follow. We climbed and climbed and the trail got smaller and smaller. Finally we arrived at camp after dark. There were several campers on the flat area leaving only a hillside for Port and me. I was totally exhausted so I tied Port directly to a tree. Normally tying to a tree would be totally unacceptable, especially if Port was to chew the bark. But I just needed enough time to get him untacked, pitch my tent and get his feed out. Port stood quietly never offering to chew the tree, so I tied his feed up and left him right there. The first noise I heard was an alarm going off at 3 AM. The campers were going to break camp and hike in the dark to escape the heat. A strange sense of loneliness hit me as the last hiker pulled out. Leaving in the dark was not an option for Port and me, so I tried to go back to sleep for a few hours to no avail. This was cougar country as well as bear country and every noise made me tense. Finally, I smelled a skunk and hoped the striped fellow would stay away long enough for me to pack up and get ready for first sunlight. Port never moved a muscle. There were no marks on the tree nor any on the ground. What a horse! When I thought daylight was only an hour or so away, I led Port to the creek to get his final drink before we started our climb to 7980 feet. We passed a south bound hiker who told me it was only 4 AM, but I could see enough to begin. The trail seemed to head straight up. Then we started to wrap around a mountain on a ledge of scree which was extremely narrow. 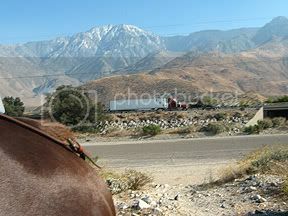 We were on the face of one of the San Bernardino Mountains with little opportunity to turn around. After crossing so much scree on such a narrow ledge I really couldn’t think about turning around anyway. Knowing that I was only a few miles from the top, I started to relax. Then, BINGO!! There was a downed tree completely across the narrow ledge! My saw was woefully inadequate to cut this big hugger. I figured I was really going to have to turn around and go all the way back down the mountain. I asked Port to back slowly so we could get to the widest part of the ledge. THEN it HAPPENED!! Port’s left hind foot started to slide on the scree. Suddenly the whole ledge gave way! We literally floated down the face of the mountain in what seemed like surreal time, with me thinking that we were in real trouble. Miraculously, we stopped on a ledge 50’ down. I looked up at the sky and thought I must be hurt, so I pushed the 911 button on my Spot locator. Then I began to assess the damage. Realizing I that I was not badly hurt, I pushed the “I’m okay” button to call off air rescue. Port also seemed only shaken. We have to be two of the luckiest beings alive. So, there I sat, wondering how I was going to get Port out of that mess. I could climb up the scree although it was almost vertical, but there was no possible way Port could. 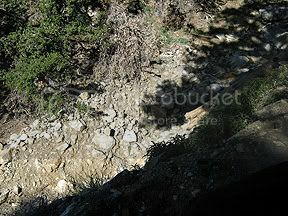 The head of the ravine had huge boulders (talus) stacked perilously on top of one another eliminating that as an option. I began moving the boulders I was capable of moving hoping Port could scramble up to the opposite ledge. After 45 minutes I asked Port to give it a try. We were within 10’ of the top when Port lost his footing, struggled to regain it and finally fell completely over backwards landing with a violent thud. Thank goodness for my saddle and pack and it in some way cushioned his fall, protecting him from the rocks. He got right up, shaking and trembling, but with no serious cuts or problems. Again I moved more rocks and tried to build a walk way for Port. The talus was just too big for me to make much of a difference, but I worked at it for another hour. This time I slowly moved Port from one spot up to another. It looked like we might make it until Port’s hind foot fell between two big boulders. He struck out at the air with his front feet as if he was trying to grab the boulders, and then flipped up and over once again. This time he hit his head and I thought he was a goner. But he got right up, shaking his head and appearing otherwise okay. That was it!! I was not going to ask him again. I had no other option but to get help. I checked the sky to see if a helicopter could get to him and saw that it was clear enough. If the forest service couldn’t help I would get someone to fly him out. 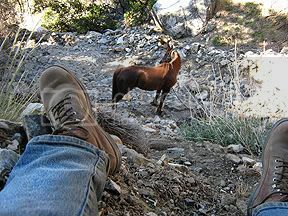 I untacked him, climbed out of the ravine and headed for the trailhead which I knew was about 2 miles up. 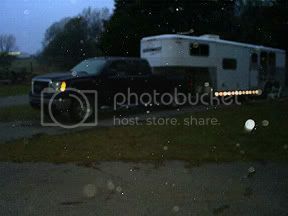 How I was able to climb and race to the trailhead as fast as I did I’ll never know, but my equine companion was in trouble and I knew that I had to get to Burton and the ONStar in the truck for help. At 8240 feet I was breathless but on auto pilot. And, there was Burton!! I ran to the truck and – NO SERVICE!! We decided to leave the mountaintop and get out in the open where there might be service. As luck had it OnStar connected and there with a compassionate horse lover on the other end. Hearing the story she vowed to get Port help. After about an hour she was able to patch me through to the Veterinarian that helped develop the horse sling for this very kind of rescue. 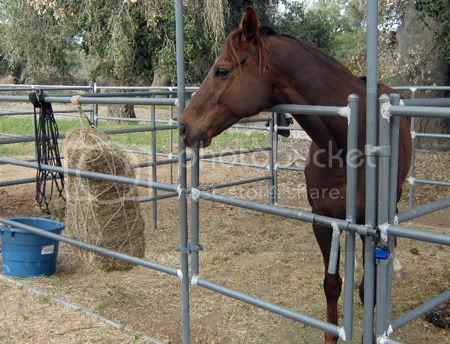 He had worked on it with UC Davis and they had made many successful rescues. He assured me that Port could be rescued safely and would gather up his people and get to the site the very next day. Thank goodness!! Port would not have to go through any more trauma. Burton expressed his concern about the cost and the Doctor said he and his group didn’t charge, but that there would be time charges for the helicopter. Okay, the plan was to go back up the mountain and take Port water and food for the night then have the forest service bring the Dr. to the site the next day. So, Burton and I head back to the trailhead. 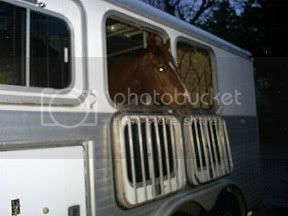 As we drive up Burton said, “There is your horse……?” “No way Port was able to climb out by himself” I replied doubtfully. But, there he was with about 10 hikers standing around him, all grinning and giving the thumbs up sign. Apparently, the hikers at the direction of Alfredo, the Italian Rider, had built a path by moving the boulders I couldn’t move. It was incredible!! Port seemed only slightly hurt with a limp in his right hind leg. One of the hikers had filmed the whole thing on her cell phone. Unfortunately, Port was asked to climb out without his saddle and pack as protection. The video showed Port falling once more. This time he hit his bare back against the rocks. But, there he was, now safely back on the trail. We just needed to get him to a camp and evaluate his actual injuries. Emotionally, I thanked all the hikers who set aside their schedules to help Port. We loaded him for the trip to Heart Bar which the forest service opened up just for Port to rest. The forest service was absolutely wonderful. They were as concerned about Port as I was, and said they would have gotten him out no matter what. So now we rest. Port is on Bute and I am taking aspirin. Tomorrow we will evaluate our injuries, hopeful that neither of us has a more serious injury that has not shown up yet. Port started today the same as yesterday. By noon he was interested in what Burton and I were doing. I was so relieved to have him respond to my voice. Still on bute, Port might have had other things wrong so I wanted to get him to the vet as soon as possible. However, I still felt we needed another day before putting him through the stress of the haul and then the vet's examination. We did some house keeping and then rested. We headed down off the mountain and to the vets with the hopes of taking Port home to fully heal. After a thorough examination revealed no serious injuries the veterinarian gave his ok for Port to travel back to Arkansas for a 3 week recuperation period. We started on a long journey home today planning to take frequent stops at real horse facilities so Port can relax. We will drive only 4 to 5 hours each day and arrive in Mena the end of this week. We covered only 4 to 5 hours each day and bedded Port comfortably in a nice stall every evening. The interaction with other horses seemed to do the trick, as Port would throw his head high and let all of them know he was the big guy on campus! Port started to eat ravenously, leaving nothing between meals and was drinking gallons of water. Only his eyes echoed the strain he had been through. Our last scheduled layover was in western Oklahoma in the town of Arapaho. The Roberts facility was perfect for Port, who had a great pen across from yearlings and mares. The Roberts commented on what a grand horse he was and I finally noticed his eyes were softening. As unbelievable as it seems, both Port and I were going to be fine. We'll rest and start light exercising in a few days with the intent of heading back to the trail the first week of June. While waiting for Port to heal, I rode Issy over the mountains and took him for several 30 miler days. Issy was indeed fit to go and since Port would be better off resting for a few months I decided to load up Issy and head west to try to finish the PCT. I went back to California alone since Burton had to work and I headed for a known horse camp where I could call the local horsemen's groups and get the latest on the trail conditions.